Labour’s biggest vote winner is the NHS in this election. It’s the only major issue that they have a lead on. We’ve written about how the Tories want to keep this election about leadership and Brexit, while Labour want to talk about delivery of services. In a sense, Labour hasn’t been totally unsuccessful. Yes, their policy announcements might have been shambolic but it certainly gets them talked about. At the start of the campaign 23% said the single issue they were most likely to base their vote on was Brexit, with the NHS lagging on 17%. In our latest polling the two are now level on 20% a piece. We delved into the public’s views on the NHS, and found hardly any difference from what we discovered in 2015, but the results are still worth going over to give you an idea about where most Britons stand on this. Put simply, the public are still wedded to the idea of the completely publicly-funded NHS. Three quarters (73%) think that the NHS must be kept free at the point of delivery. However, there is a public understanding that there are serious issues with the service as it stands but relatively few are prepared to take more drastic steps to change the system. Almost three in five (58%) think the NHS is in a worse state than it was 5 years ago, while only one in ten (9%) think it has improved. By comparison, going into the 2015 general election a fifth (19%) believed the NHS had got better over the preceding 5 years and half (51%) thought it had got worse. So the public clearly think there has been a further deterioration in the NHS. But the more radical solutions seem to be ruled out. Only 35% would be happy to pay to use some services on the NHS. Although this does rise to 52% of higher rate taxpayers, the average man or women in the street is not happy to do this. Indeed, while higher rate taxpayers broadly believe the UK will need to develop an insurance-based health system in the long-term (50% agree vs 30% disagree), basic rate taxpayers rejected this premise on balance (31% agree vs 40% disagree). 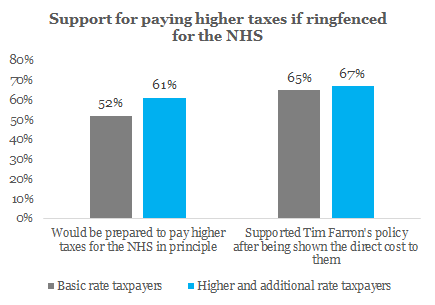 However, although relatively few were prepared to dig into their pockets to fund their own healthcare requirements, half (49%) did say they would be prepared to pay higher taxes if they knew it was going directly to the NHS. We tested out the Liberal Democrat proposal, by asking UK adults what their personal income was and then telling them what their potential bill would be if an extra 1p was placed on all income tax bands. So, someone on £17,500 per annum was informed that the policy would cost them £60 extra a year in income tax and then asked whether or not they supported it, while those on the cusp of the higher rate tax band (£42,500 per annum) were told it would cost them £310 extra each year. When taxpayers were presented with how little (or in some cases high) the bill would be, two thirds (65%) supported the higher tax bill if it was ringfenced for the NHS and social care. What this also does is shore up the support of those in the lower income groups. Naturally, those with tighter budgets were more reluctant to commit to the principle of paying higher taxes just in case that in practice it meant a “tax bombshell”. 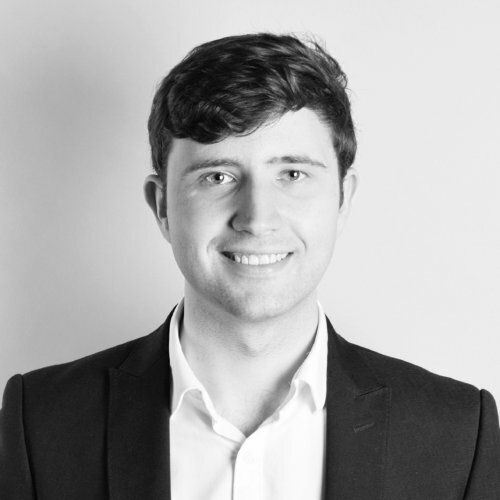 Once you put a figure on it, basic rate payers are signed up to the concept of Tim Farron’s tax policy as much as those in the higher tax bracket. However, what this does mean is that it’s a policy that has to be carefully communicated. These findings have implications for the Labour Party especially. If Labour is seen to continually talk about higher taxes to fund public services, it’s more likely to scare off regular taxpayers and not the higher earners who they claim to be targeting. See the full excel tables here.